Jon/Liam as per amazing usual was 'Aving it BIGtime ! - more front than Blackpool pleasure beach, more balls than a row of pawnbrokers, more in your face than an Antifa protest march. Little Ariana did great to get just Liam on stage for her big charity do; Glasto got the 2 brothers, but miles apart, only Rawpromo got them both on the same stage, no problemo. 'Pot Top Trumps! Oasis hit after hit after classic Mancunian masterpiece rolled off the Oh. quality controlled production line. Seemingly the entire G. bros.' back catalogue except Round R Way n Acquiesce (which they promise to do in October at the Rescue Rooms.) So wall to Wonderwall excellence throughout, then 'Don't look back in Anger', a stripped down,acoustic + tambourine only Flowerpot exclusive version (called by Noel /Scott in the Green Room five minutes before showtime) - genius ! , and a sold out 250 crowd singing their little larynxes out. Brilliant ! Tingles. Goosebumps. Lumps in throat time. It is rapidly becoming battered Britain's unofficial and the People's National Anthem.(Sorry,Queenie!) 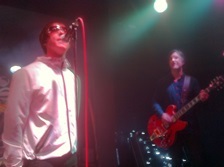 Then Liam/Jon sidles back on to belt out 'Live Forever'- "for Manchester!" The band were now into top gear, max revs -avin' it with a capital A and the crowd were lovin' it- cue some serious, out of it dad dancing and bounce-bonding with random strangers, all of us swept up in the oh so marvellous moment. After a cracking Champagne Supernova sing/screamalong, the Fantastic Five encored with an out of left field, strobe-tastic My Generation by the Who which ignited some Moss Side style moshpit mayhem, not just down the front but all over the room! Live music will never F-F-Fade away with meta-tribs like Ohasis ruling the stage. An absolute bloomin pleasure boys. Nailed it.Smashed it .Owned it .